Last edited by Bren on Fri May 04, 2012 8:04 pm, edited 1 time in total. 1.Welcome: Welcome to the Town of Odyssey, or, as it's often referred to as, the ToO! We're glad that you joined. Below you'll find some helpful information that will help you as you learn your way around the site. 2.Tour the forums: When one comes to a site like this, it can be hard to know where to post certain things. This section explains the sections. Are you new in town? Unfamiliar with what to do first? Pop in and take a look at several helpful guides to get you settled into your new home! You'll also find Mayoral announcements to keep you abreast of the latest developments in The Steps of City Hall ! Description: For the Drama Kings or Queens of this board, where we discuss acting, plays we are in or trying out for, and acting techniques. Join these and other great factions by using the link below. The Ruins of the Town of Odyssey is a special section that holds the very history of this site. From story arcs, to the celebrations of seasons like fall and winter. Plus archives for past ToO elections and a whole lot more. Last edited by Bren on Mon Nov 21, 2011 11:23 am, edited 3 times in total. It has most of the features of the full reply page, but is lacking some such as the smilies. Simply type your message, hit submit, and you're good to go! makes a simple smilie. If you wish to change the color of your text, highlight it and click the color on the right that you want. To learn how to use the BBCode buttons, see "Using BBCode." Make sure the first two boxes are unchecked so smilies and formatting will work correctly. If you wish to have your signature attached, make sure that is checked. You also have the option of whether to get emails when the topic is updated. If you want to include an attachment on your post, select browse files, choose the files you want, and hit add the file. It will then be available to place in your post. After attached, you can select "Display inline" to have it appear in the body of your message. BBCode is how to format your text. You can read a guide on how BBCode works HERE - it includes instructions on how to make your text bold, italicized, or underlined, change the color and size, make lists, how to quote people, and how to insert images and links into your post. Below are explanations of how to use the other custom options available. mP3: If you have a link to a mP3 file, using the mP3 tags will display a player. spoiler: Spoiler tags are useful if there is information in your post others may not wish to see. Also, if there are large pictures or blocks of text, you can put it in spoiler tags so the page won't take quite as long to load. youtube: You can embed YouTube videos in your post by enclosing the link to one in youtube tags. 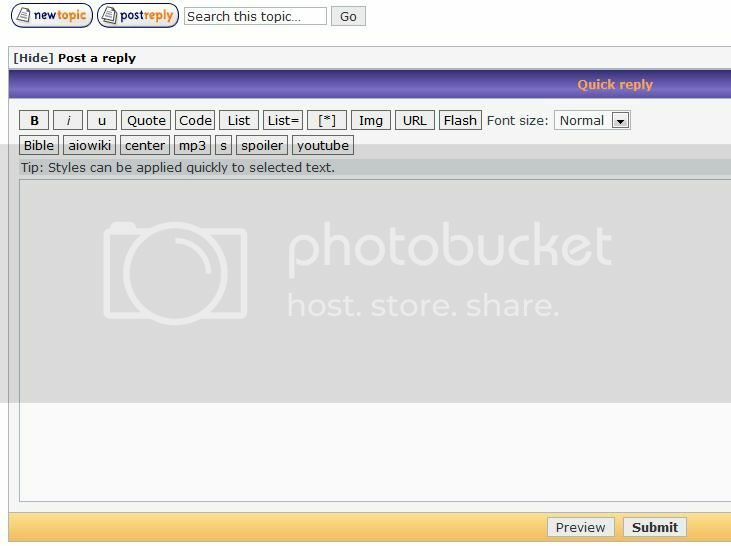 At the top of every forum, there is a button that says "New Topic." Click, and it will bring up a page similar to the regular reply page. There are a few more options to choose from. First, you have to make sure to fill in the topic title, and you can also choose to write a topic description and choose an icon. You can choose whether to let people vote for 1 or more options, run it for a limited time or let it stay open indefinitely, hide the poll results until the time is up, and whether or not to let people change their vote. After titling the topic, writing your message, and deciding to add a poll or not - you're all done and ready to hit submit! A private message is almost like an email message that you can send to one or members on the board. It's not publicly posted, hence the term private message. To get to your inbox, look at the top left of your screen. You can access your PMs by clicking on the new messages button or by going to your User Control Panel and clicking on the private messages tab. When you bring up the inbox, you can see a list of options in a box on the left. 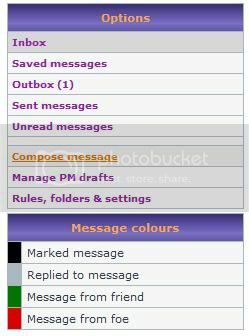 Starting out, you have the Inbox for PMs you receive, the Outbox for ones you send that have not been read yet, the Sentbox for those sent that HAVE been read, and Saved messages. You have the option of creating extra folders for whatever purposes you want by clicking on Rules, folders, & settings and naming and adding a new folder. You can create many different kinds of custom rules for your messages - for example, if you create a folder for Messages from Friends, you can make a rule that says all PMs from friends go automatically to that folder. Experiment and see what you want to do! To send a new message, click on the Compose Message button. This is basically just like a post, but you have to add the username of the person/s you want to send it to. You can click Find a Member if you can't remember the exact name or spelling. You can add multiple people, as well as selecting one of the premade groups on the side. For example, selecting the Mayoral Team for your recipient will send your message to the current mayor and chief of police as well as Catspaw, the head admin. You can also choose to BCC (blind carbon copy) another member in addition to the main recipient and no one will see that that they were sent it as well. 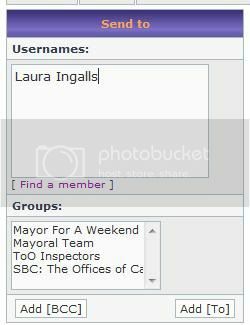 Once you type in the names you want or click the group, click the Add [To] or Add [BCC] buttons. One difference between posts and PMs is that you can save your private messages in a draft to finish later. To access your drafts, go to Manage PM Drafts, and load the one you want to finish. 4 . Board Features:The Town of Odyssey has many exciting features! You have the ability to set up a bank account, run your own blog, buy stuff from the Shop, join a raffle, play in the arcade, watch TV or post your thoughts in the Chat! Most of these are based on phpBB Modifications, except for Chat and ToO Tv. The Arcade: This is the place for games! The Arcade has popular games like Tetris, Donkey Kong and Pacman, and they only cost $0.25 per play! The Bank is a place where all your money may be kept! You have the option to set-up an account and deposit or withdraw cash from the bank. You should receive interest each day, based on your current amount of wealth. The Blogs are designed for people who have much to say! You can create a blog, publish posts, choose a Layout, and follow other blogs! The Chat is a great place for general discussions, and often for special board-wide commentaries and chats. You'll need a "nickname" to chat, and have the option of using Mibbit, Java or IRC chat programs (which are explained at the chat site). The Raffle is a game (also called the Lottery) where once enough users have bought a ticket, a drawing is held and the winner takes all. The Shop is a place to buy things of all varieties (using your ToO money). Once purchased, these items go into “your inventory” for all to see. ToO TV is a place to watch and listen to various podcasts and such. Designed by Eugene to work with Microsoft Silverlight, the application plays both audio and video. In the future, users may be able to upload their own content. Elections occur every four months on the Town of Odyssey. An election board will be set up three months into each term for the teams hoping to be elected. The team, consisting of a Mayor and Chief of Police (COP), can create a thread to begin their campaign. The amount of money necessary for a team to officially be in the running can vary from term to term. The teams raise the money by persuading the citizens of the board to donate by what the teams are offering for their term in their official campaign thread. Once a team has raised the alloted amount of money, they are granted a faction for their team head quarters where they can discuss the election and share new ideas with their supporters. At the end of the fourth month, a poll will be held to decide the winning team. Moderators, or mods, are chosen by each newly elected team to keep the board running smoothly. These people are chosen for the position based on their behavior on the board: if they follow all the rules, if their posts are meaningful, and if they are all-around upstanding citizens. Birthday threads for the Town of Odyssey are created to celebrate the day that Shadowpaw created the ToO on April 1, 2005. There will be a board-wide celebration, so grab your friends and come join the party! Special events can occur during any team's term who wish to provide a board-wide fun activity. Different events that have taken place in the past are the AIO Risks and Rewards, Mayor for a Weekend, and different holiday celebrations. FM - Finneman's Market, the place for general discussion. FTW - This stands for "For The Win." GF - Gower's Field, where you can role play to your heart's content. HH - Hillingdale Haven, all crazy, fun, and game threads go here. HT - Harlequin Theatre, where media discussion takes place. Newb - Newb, n00b, or newbie can have a couple of meanings. One, it's simply a member who is new to the board. Second, it is someone who is still getting used to things so they may spam, have bad grammar, and other non-desirable posting skills. Once you form some relationships, post maturely, and are comfortable on the board, you won't be considered a newb! NPC - This stands for Non-Playing Character. Essentially, on the ToO it means characters like Whit and Eugene who are controlled by other members for story arcs and such. (See below for explanation of story arcs.) They will post as if they really are the Odyssey character. PM - Private message, explained above. RPG - Role-Playing Game. If you like to make up characters and act out stories, you may enjoy role playing in Gower's Field. Read a Newbie Guide here. Spam - Spam is undesirable posting behavior. This can be posting a LOT of short posts, posting on months old topics, off-topic posts, and posting just to get money and/or boost your post count. Shadowpaw - Shadowpaw is the founder of the Town of Odyssey. He opened the board on April 1, 2005 and was the head administrator for a couple years. While he has had to leave for real life, he may pop in occasionally just to say hi. Story arcs - One unique thing about this board are the story arcs that take place. There is a secret panel of ToO members who work on story arcs and control the NPCs. Things happen on the board such as Regis Blackgaard coming back, Bennett Charles taking over the board, etc. Usually the bad guys are up to no good, and the members of the ToO are supposed to jump in and help foil their plans. Often there are clues and codes to be found, and everyone works together to figure out what to do. TH - The Town Hall. This was an AIO message board that preceded the ToO. Shadowpaw and other older members were once members there before he opened this board. WE - Whit's End, where you can talk about all things related to Adventures in Odyssey.